Clementine joined our family at just 10 weeks old in November of 2016. It wasn’t long before she began joining me on mountain bike rides and soon earned her title of a “trail dog”. Staying loyal to her master “Clemmie” tends to run alongside me always with a smile on her face. She knows the bin that I keep my cycling clothes in and gets excited when I pull it out and she sits at the car door as I load my bike eagerly waiting for me to open it. Her cheery personality and friendly face are known grab the attention of fellow cyclists and hikers and after a quick visit she’s on her way again. For the past 18 months, this is the only life she has known. 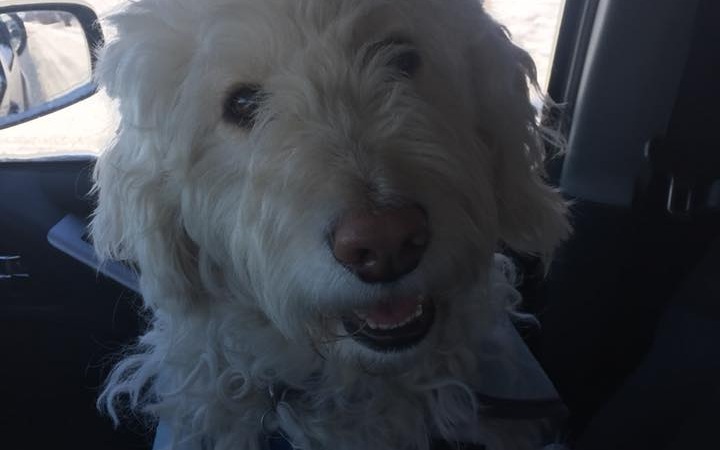 Clemmie is a labradoodle, a breed known for their high energy and need for regular activity. Sadly, labradoodles are also predisposed to Cataracts. Just eight weeks ago I observed Clementine behaving strange while cycling but later learned that there was a bear with babies seen recently on the trails so I assumed she was distracted by their smell. Weeks later I observed the same behavior but this time noticed that she was going off the trails through tall grass and running into small trees and even my bike when I’d come to a stop. After a more thorough evaluation I noticed that her eyes were hazy and her vision was skewed. A visit to the local vet confirmed that she had juvenile cataracts in both of her eyes. In her 40 years as a vet our Dr. had never seen cataracts in such a young dog. This past week Clementine had a visit with a Veterinarian Ophthalmologist. After a series of tests the specialist informed me that Clementine has Progressive Juvenile Cataracts. Her vision today is at an estimated 40%, and the Vet believes based on how quickly the cataracts have developed that in two months she will be completely blind. Just like for humans there is a surgical procedure that can restore Clementine’s vision with a 95% success rate, but these procedures aren’t cheap and as a single parent I don’t have $4,400 tucked away for emergencies like these. The specialist has recommended that Clemmie have this surgery right away to avoid future complications including Glaucoma and infection. I’m heartbroken at the thought of Clementine’s lifestyle having to change so quickly and dramatically. Like most people’s pets, she is like another child and one of my best friends. She brings a smile to my face on my most crappy days and I’m willing to do whatever it takes to provide to her the life she deserves. Any amount donated to help fund this surgery would be greatly appreciated. As a thank you to all who are willing to donate my family and I are committed to volunteer 1 hour throughout the community for every $100 raised.